As outlined in the first and second post of this series, the basic idea of separating “trusted” and “untrusted” clients is to set up separate VLANs and move clients to different VLANs. For clients connecting via WiFi, different WiFi networks can be configured and each WiFi network can be associated with one existing VLAN. I ended up buying a refurbished Dell PowerConnect 2816 off of eBay from a local business. The switch came with a one year warranty and arrived looking like new. — But unfortunately it just looked like new. The Dell PowerConnect can either operate in managed or unmanaged mode, and there’s a small switch behind a pinhole that you can push with a paper clip to toggle it. However, toggling the switch between managed and unmanaged mode does not mean that the switch’s managed configuration gets reset. This is an issue because the switch I received was apparently not reset to factory defaults, since I could not connect to the default management IP (192.168.2.1) using the default username/password combination (admin/no password). You can then connect the USB to serial adapter to your computer and the other end to the switch via the null-modem cable. But the fun doesn’t end there: With a serial line both ends have to match configuration parameters and communication speed in terms of bits/second. While Dell does again do a good job documenting that the default is 9600bits/sec and 8N1, the problem is that we are not dealing with a switch in its default settings. While the 8N1 is not open for guessing, the transmit speed might have been changed. — So in order to reset a switch that runs an unknown configuration you also get to guess the serial line speed to use. Fortunately, in practice this comes down to maybe half a dozen settings you have to try. Here are instructions on how to reset the switch to default settings using your null modem cable. — And yes, you have to hit a TWO SECOND window between when the switch comes up until it continues boot-up. Putting this all together I probably wasted close to an hour to figure all this out and guess the right serial line speed and what not. Also, why Dell lets you toggle the switch between managed and unmanaged mode via a pinhole reset button but decided to omit a “reset to factory default” that doesn’t require fiddling with serial ports and null modem cables I do not know. 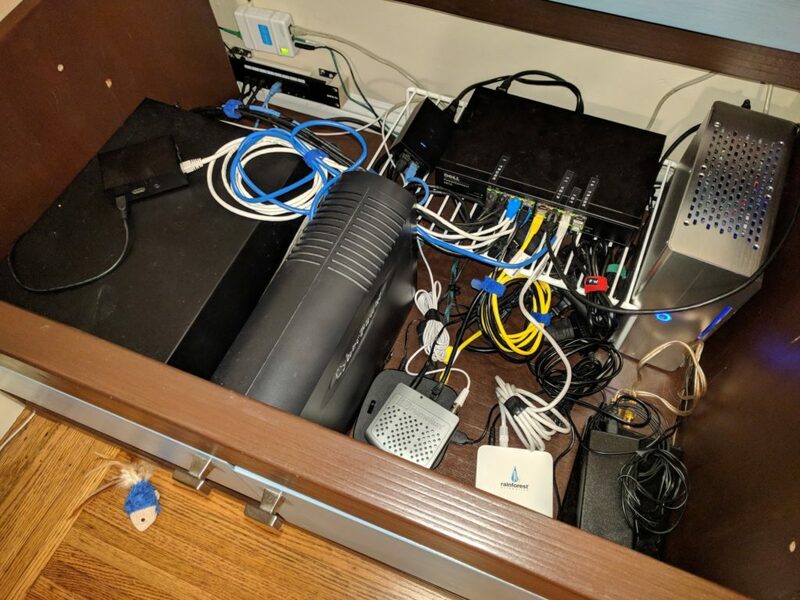 I get the whole security angle, but if I have physical access to the switch, I might as well unplug a cable/insert my own packet sniffing gizmo between the switch and the connected client. But on the bright side I got an enterprise-level managed 16 port switch for about USD 55 including shipping, and I spent about another USD 20 for the USB/serial adapter and the null modem cable. And once I got the switch set up it turned out to be a solid performer. My goal was to set up VLANs in a way so that clients connecting to the switch can be blissfully unaware that they are on a VLAN: The idea is to teach the switch rules such as “all packets received on port 3 actually belong to VLAN 10, so tag all the untagged packets coming in. Discard all incoming packets that already have tags. Before forwarding a packet out to port 3, check that it is tagged for VLAN 10, otherwise discard it”. While this works fine for clients such as, say, my desktop computer plugged into the switch, this does not work for the port that the pfSense router and the Ubiquiti Unifi AC Pro WiFi access point are plugged into: These devices need to see all packets on all VLANs: pfSense needs to route them and the access point has a WiFi network for each VLAN so it does the tagging and VLAN isolation by itself. Configuring port on the switch this way is usually called “Trunking”, but you won’t find this term anywhere in the Web UI for the PowerConnect. — This is not a shortcoming, but it seems that different vendors use different terms. Here is a good description of how to set this up on the Dell switch. Just mentally substitute “the other switch” with “the pfSense router” or “the wireless access point”. The remainder of the network setup was smooth sailing. Setting this up is really trivial. I got the Unifi software running on my pfSense firewall, as described in my earlier post. You can set up additional WiFi networks and assign them to a VLAN each within a minute. Setting up VLANs on pfSense is also fairly easy. There are several good tutorials online and I ended up using this one. Enphase Envoy: The Only One Who Gets This Right! The Enphase Envoy is a little device that talks to your inverters on the roof and then acts as a web gateway, allowing you to view current solar energy production and it also sends the data to the Cloud. While still connected to the current WiFi network, you log in and navigate to the “Wi-Fi Configuration”. You are presented a list of WiFi networks the Envoy found, or you can enter your own SSID in case your desired network doesn’t broadcast one. Specify credentials and hit “Test Connection”. You hit yes and you are done. The Juicebox is a gizmo that lives in our garage and plugs into an existing 240V outlet that was originally put there for an electric dryer. On the other end of the Juicebox there is a 24ft cord that plugs into the charging port of our car. The Juicebox reports state of charging via the internet and lets you set up charging windows, so that you can charge at night when electricity is the cheapest. Overall it is a really neat product and does its job very well. I found a link to instructions provided by eMotorWerks here, that doesn’t require you to log into their help desk with a username/password. Basically, every time you unplug the Juicebox and plug it back in, you have a ~30 second window in which the Juicebox broadcasts its own WiFi network. You connect to it and you land on a setup page where you enter info for the WiFi connection the Juicebox should use. Find the little Torx screwdriver that came with your doorbell. Go to the front of the house, smartphone in hand, with the Ring app open. Unscrew the plate covering the setup button. As instructed by the Ring app, press the setup button. — Wait a few minutes and realize that this isn’t working because your Ring app never manages to detect that the doorbell is in setup mode. Hold down the doorbell’s setup button for about 10 seconds till the light on the doorbell goes out. Let go of the button. Doorbell reboots and goes into Setup Mode. This time the app detects the doorbell in Setup Mode. Enter new WiFi info and cringe when your doorbell tells you that “Rome wasn’t built in a day”. Nest Protect v2: Seriously, Google??? Go get your favorite ladder. Run through your house and unplug each and every Nest Protect in your house from your wiring and remove them all from the ceiling. Put them together in one happy group on your living room table. REMOVE all of them from your account. Dear Google, please contact Enphase to see how something like this should be handled. I installed one of these light switches because I wanted some project running on a Raspberry Pi be able to control that switch (a story for another time). — This only sort of, kind of worked, so I resigned and set this thing up via IFTTT for “turn on the light on the front porch when the sun sets, and turn it back off in the morning”. Before restoring your Wemo device to its original settings, make sure that the Remote Access feature and any rules associated to it have been disabled from every mobile device that is connected to the Wemo device. If you do not disable Remote Access from these devices, you may need to re-install the Wemo App later on. I am not sure what happened but this step never worked for me. The “Disable Remote Access” option was always disabled in the WeMo app. I proceeded anyways and I managed to get the WeMo switch connected to the new WiFi network. Apparently IFTTT can still talk to it because the light turns on/turns off as intended. However, the WeMo app is no longer able to communicate with the switch, no matter whether my phone is connected to the same WiFi network or not. No means of deleting the WeMo app from all my Android devices/Clearing the App Data/reinstalling the WeMo app has solved this. For now it works for what I need it to do. Should this ever fail I will probably just rip it out and install a solar timer. Not everything needs to be connected to the Interwebs. — At least I know the solar timer will never become part of a botnet. At least it is done now. And I don’t want to go through this procedure again. But this experience has only reaffirmed my belief that IoT devices should be relegated to their own network. One thing that became annoying was that clients connected via ethernet, such as our desktop computers, were seeing a 30 second delay from when they were powered on until they were able to communicate over the network and get a DHCP lease. While this is not an issue with devices that are always on, such as our file server, this turned out quite annoying for desktop computers that are turned on and off every day. After scratching my head for a while, I found out that this behavior is caused by the Dell PowerConnect switch. — Since this is enterprise-grade hardware, when it detects a new link on a port, it will not immediately start forwarding packets to/from that port, but first make sure that the new link did not cause a loop in the ethernet fabric (Spanning Tree), which would bring the entire network to its knees. Turns out there is an option for that. On the Dell switch you can enable the “Fast Link” option for one or more ports. In that case the switch will start forwarding packets to/from a new link immediately. Downside is your network might be hosed for a while since there is a window where a loop might exist in your network, until the switch detects it. However, in my case loops are pretty much impossible since I have only one switch. — Here is a good description on how to enable “Fast Link” on Dell PowerConnect 28xx switches, which resolved this final issue. Things with the WeMo switch got from bad to worse over time. I was never able to restore access to the switch, but IFTTT still managed to communicate with it. However, this feature is now starting to get flaky as well and the light would sometimes not turn on or turn off. I decided to not waste any more time with this device and replace it with a ZWave switch that can be controlled by our alarm system.